The Provinces of the Roman Empire (A.D. 119). 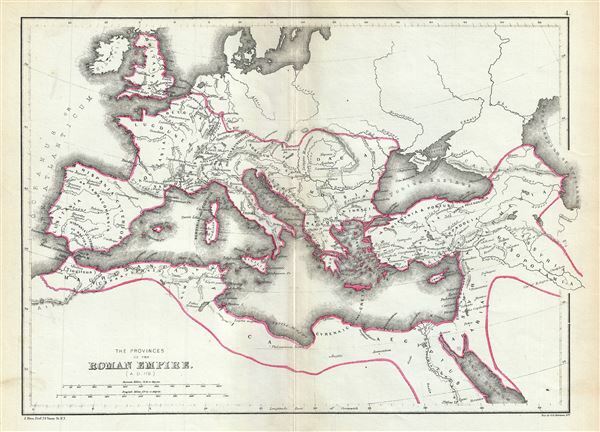 This is a beautiful 1867 map of the Roman Empire by William Hughes. The map shows the extent of the Roman Empire in AD 119, covering most of Europe, the Middle East, Asia Minor and parts of North Africa, including Britain, France, Egypt, the Barbary coast, Spain, Italy and Macedonia. The Roman Empire was established in 27 BC after Gaius Julius Caesar Octavianus, the grandnephew and heir of Julius Caesar was awarded the honorific title of Augustus. During the time of the empire, Roman cities flourished. Trade spread as far as India, Russia, China and Southeast Asia. The empire reached its greatest extent during the reign of Trajan (98 AD – 117 AD), the thirteenth Emperor of the Roman Empire. However, the sheer size of the empire and its success also contributed to its downfall. The Western Roman Empire collapsed in AD 476, when Romulus Augustulus was deposed by the German Odovacer. The Eastern Roman Empire, by evolving into the Byzantine Empire, survived until the Ottoman Turks captured Constantinople in 1453. This map was created by William Hughes, printed by J. Bien and engraved by G.E. Sherman, for issued as plate 4 in Sheldon and Company's An Atlas of Classical Geography.